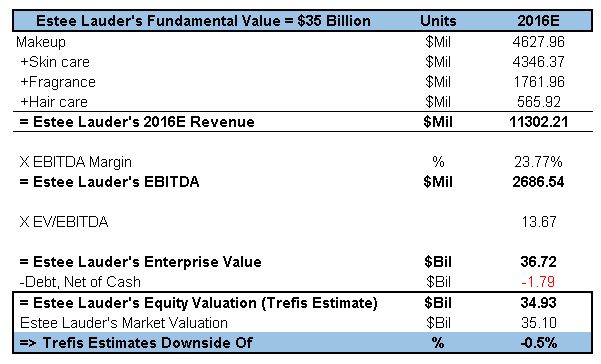 What Is Estee Lauder’s Fundamental Value Based On 2016 Estimated Numbers? Estee Lauder’s fundamental value based on estimated 2016 numbers is around $35 billion, almost in line with its current market valuation. Have more questions about Estee Lauder? See the links below. What Is Estee Lauder’s Revenue And EBITDA Breakdown? What Is Estee Lauder’s Fundamental Value On The Basis Of Its Forecasted 2015 Results? How Has Estee Lauder’s Revenue And EBITDA Composition Changed Over 2012-2016E?